More than 200,000 Taiwanese anti nuclear protesters gathered together for the 308 No Nuke Movement. The rallies are held in north, center, south and east of Taiwan. These events will be followed by No Nuclear Night Functions to represent their determination in terminating the dirty nuclear power plants from running and commissioning. We love Formosa Taiwan and we have had enough listening to the lies from the government and Taipower. 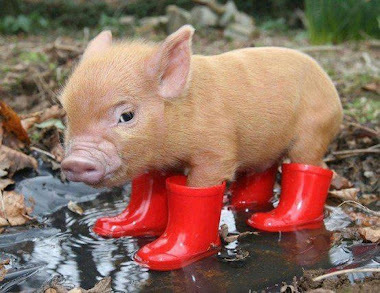 Please say a big NO to nuclear power plants. Together, we people will make a Nuclear Free Taiwan!!! Tens of thousands have marched in anti-nuclear protests across Taiwan, calling on the government to phase out nuclear energy. The protest comes ahead of the third anniversary of the Fukishima disaster. 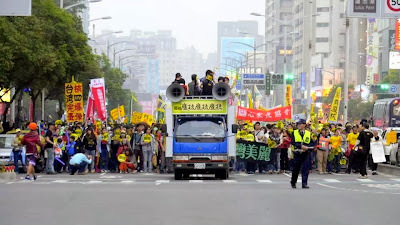 Anti-nuclear protesters in Taiwan held four rallies across the country on Saturday, urging the government both to stop construction of a new nuclear power plant and to abandon nuclear power altogether. 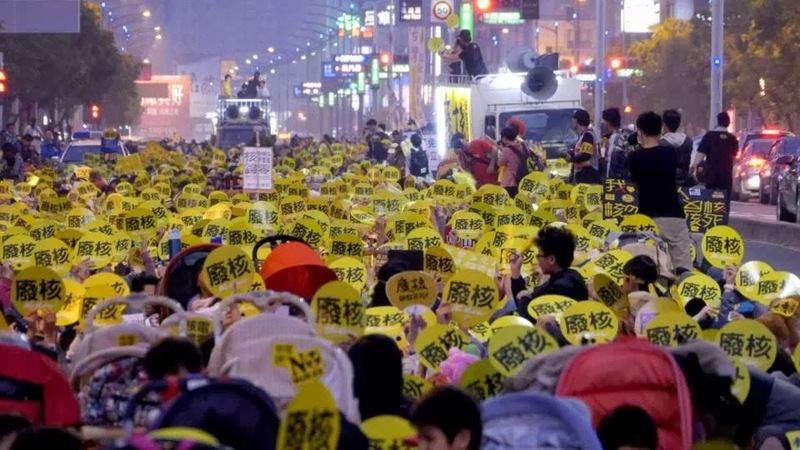 Organizers said some 50,000 people attended the protest march and rally in the capital, Taipei, while three other events held simultaneously in other parts of the country drew a combined total of some 30,000. The Taipei protest was attended by members both of opposition parties and the ruling Kuomintang (KMT). Concern about the risks posed by Taiwan's atomic power plants has been growing since a 9.0-magnitude earthquake and tsunami unleashed a nuclear disaster at Japan's Fukushima plant on March 11, 2011. Taiwan is also regularly hit by earthquakes, raising fears that its currently three nuclear facilities may be similarly vulnerable. Protesters called on the government to cease construction work on a fourth plant that is being built in a coastal town near Taipei. The plant was originally scheduled to be completed by 2004, but the project has been delayed by political wrangling. Several polls conducted last year showed that about 70 percent of Taiwanese oppose the building of the plant, which is situated near undersea volcanoes. The existing plants furnish about 20 percent of the country's energy needs. 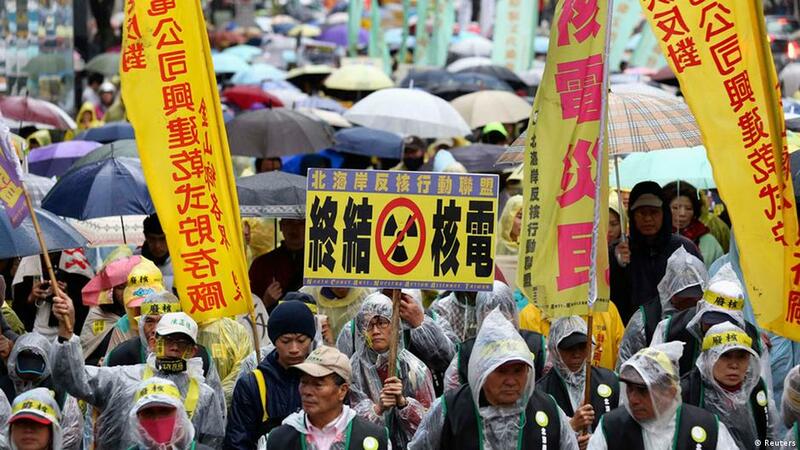 Tsui said the alliance, along with several dozen civic organizations such as the Homemakers United Foundation, Taiwan Association for Human Rights and Taiwan Environmental Protection Union, would call for the scrapping of nuclear power plants. “We hope to renew people’s passion for this issue as the anti-nuclear movement has entered a critical stage,” as the fourth nuclear plant could begin operations soon, Tsui said. The Ministry of Economic Affairs said earlier this year that safety inspections on the nearly completed power plant are expected to run through June, and that if all goes well, it could start fuel rod installation by the end of the year. The inspections were initiated in an effort to ease widespread public concerns after the 2011 Fukushima Dai-ichi nuclear power plant disaster in Japan, which was caused by a massive earthquake and tsunami. Construction of the fourth power plant in New Taipei City’s Gongliao District (貢寮) began in 1999, but the project has repeatedly stalled due in part to the changing political climate and rising opposition to nuclear power. have been taken to avert a Fukushimatypdisaster. the nation has a steady and adequate supply of electricity. as the other three decades-old plants will be decommissioned eventually. National Taiwan University’s main entrance.